On the 100th Anniversary of the end of the Battle of Passchendaele it is fitting that the spirit of the men that fought in the First World War is remembered. New company Really Productions have decided to stage the whole BBC series live on stage. The result is a poignant and entertaining evening. As a child I was brought up on World War 2 films. The Dam Busters was one of many that would be on BBC2 most weekends. The First World War was largely uncovered with the notable exception of All Quiet On The Western Front that had a 1979 remake which left a lasting impression on me. It was if WW1 was, as far as the media went, a forgotten war. As I started work as teacher I was one of only 2 teachers in my department that would stop our classes at 11am on the 11th November. Why? Out of respect for my Great Grandfather who had been there but never talked about it to me. I only discovered his bravery when he died and we saw the medals. Blackadder had started in 1983 and it had 3 series poking fun at historical figures. The 1989 series was different, writers Richard Curtis and Ben Elton were going to create laughs about a tragic war when some of the brave men and women involved were still alive. Tragic? As wikipedia puts it about just the Battle of Passchendaele: “In the Official History, Brigadier-General J. E. Edmonds put British casualties at 244,897 and wrote that equivalent German figures were not available, estimating German losses at 400,000.” Those figures are hard to imagine. The resultant TV show Blackadder Goes Forth was ranked #16 in the British Film Institutes 100 Greatest British Television Programmes in 2000. Somehow Curtis and Elton have written a show that returned the heroes back into conversation. Really Productions are staging the entire show, with the exception of episode 2 Corporal Punishment - which was about the pigeons role in the war. 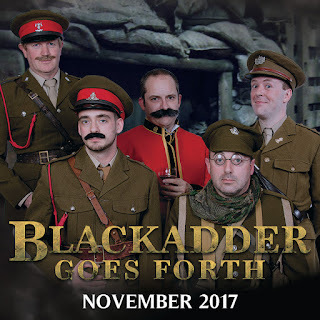 Each of the 5 remaining episodes is run in order across a set which consists of General Melchett’s lavish office and the cramped living quarters of the trench. The roles are iconic. Rowan Atkinson, Tony Robinson, Hugh Lawrie had great chemistry as our trench heroes whilst Stephen Fry, Tim McInnerny and Rik Mayall created the crazy characters elsewhere. The good news is that from the moment Jonny Woollett started as Edmund Blackadder, the long time professional soldier, it was clear that the casting had been perfect. Blackadder is all for self preservation and staying alive. Andrew Neale is the overly positive Lieutenant George who cannot wait to go over the top and give the Germans “six of the best.” Joe Costigan appears as Baldrick, representing the humble Tommy, he isn’t entirely sure why there is even a war. Running for over 2 ½ hours we get to see our heroes avoid going over the top by entertaining the troops, running painting competitions, joining the Flying Corp and hunting German spies in a hospital. The script allows for a large number of regular laughs and the audience were regularly laughing at some classic sit-com gold one liners. One of the reoccurring themes is that back office is run by Captain Darling (Ian Cairns) and Woolett is able to get his Blackadder to insult his fellow Captain everytime he refers to him by name. Even Darling’s commanding officer General Melchett (Mike Fleetham) causes Darling to visibly wince by the tone in which his name is spoken. Each episode has additional characters to add to the general mayhem including the flamboyant air ace Lord Flasheart (James Mitchinson) who has a very non-PC view on life. The sound design by Jonathan Mellor was of the usual high standard one has come to expect from Tyne Audio. The incidental recordings came across at the same level as the performances on stage, which isn’t always the case in shows. We had a few first night nerves with the lines but it is an incredible amount of dialogue to deliver. Whilst most of the transitions ran smoothly, occasionally the change from the trench to the office led to a long pause. Having said that, the comic timing as they appeared in the living quarters at just the right moment in the dialogue was perfect. 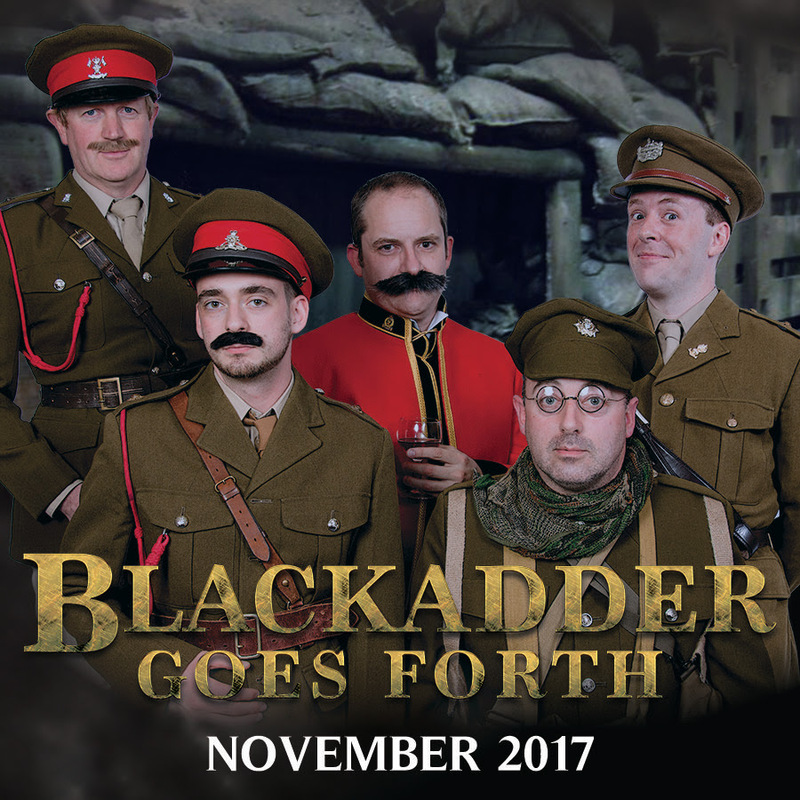 Blackadder Goes Forth is a fabulous tribute to the men and women who served during the Great War. This production, just like the TV series, keeps the laughs flowing right up to the end. Directors Bryan Watson and Chris Johnson obviously understand why the original series was so popular. But at the end the laughs stop as the lads climb the ladders out of the trenches in the Big Push. A fitting tribute included a perfectly observed minutes silence at the end and a collection for the Royal British Legion. Tickets: Booking line 0844 2491 000 or online from our affiliate Eventim UK LINK.